down pain wherever I can get it. I don’t like all my nicknames, but I can’t say I don’t deserve them. Debbie Downer is the one I earned for introducing grit to conversations of spun sugar. And one I continue to earn. 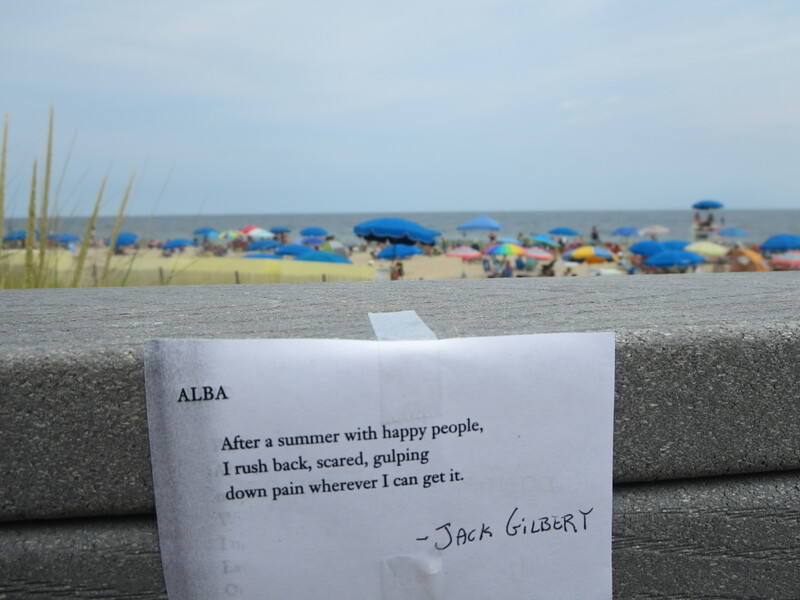 At Bethany Beach in Delaware, the “Quiet Resort,” as they call it, a family beach town where I’ve spent many happy week, I left Jack Gilbert’s “Alba” for all the happy people to read coming or going to the beach. A little salt in the sugar. It’s such a lovely little poem, I hate to associate it with something nasty, but an incident at the beach comes to mind as I write. 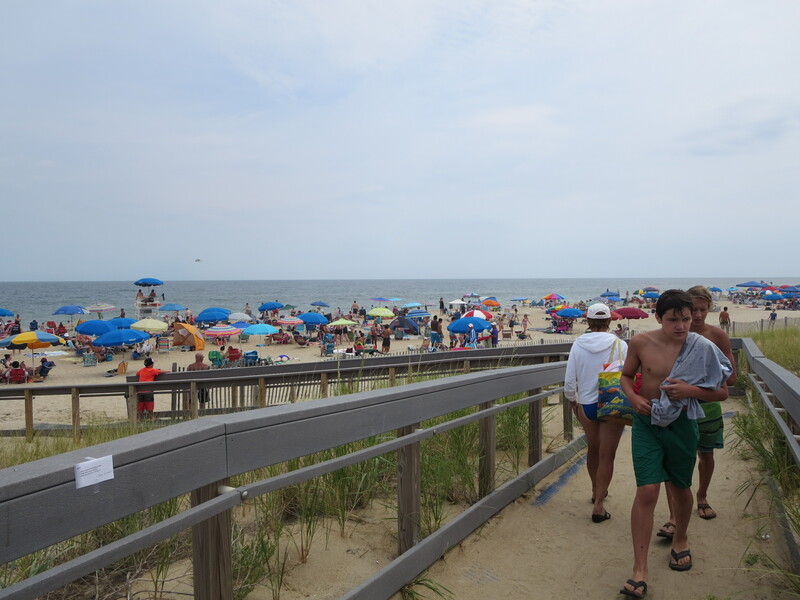 On the Bethany boardwalk, I passed a young man in a “Mein Kampf” t-shirt. A teenage girl walking past, a girl accompanied by her mother, called out, “Hey, I like your t-shirt.” Silly kids, infuriatingly ignorant kids. But considering them in the light of this poem, I wonder if they throw ugliness out into the world for the same reason the speaker in the poem gulps down pain. The happy faces surrounding them feel less real than the turmoil they feel inside. Or maybe Mein Kampf is a popular rock band, what do I know. An “alba” is a short poem, often three lines, that describes the longing of lovers who have to part in the morning so their spouses won’t discover their tryst. I had never heard of the alba lyric till I wondered why Gilbert titled his poem as he did. Now I look at the poem in another light: the speaker “cheats” on his melancholy with happy people. But unlike traditional lovers in an alba poem, he seems eager to return to his spouse. Poet Jack Gilbert lived outside the mainstream as well. He was born in Pittsburgh in 1925. He failed out of high school, and worked as an exterminator until he was mistakenly accepted to the University of Pittsburgh because of a clerical error. He spent the 1960s in San Francisco but didn’t drink or do drugs. All his life he was a traveler. He spent many years in Europe, living simply and touring as a lecturer on literature for the State Department. Gilbert didn’t publish much and didn’t give many public readings. He published his first book in 1962 and his second twenty years later in 1982. He died last November at age 87. Words to ponder as I return from the beach.